What happened to Gary Kubiak? Is he still in the running? You're not a real fan. But I understand the economics. Browns fans have stayed with that team through a transfer to Balimore, PSLs, Tim Couch and Brady Quinn. You're either with you're team or you're not. You keep them if they recover and can beat out new competition. We talked on one of the previous sessions during the season about whether S. Baker, S. Weatherspoon, and some of the injured OL will be back for 2015. How tenuous are there stays in the ATL now? Baker just got resigned within the last season or so, but the others (M. Johnson, Hawley, etc.) seemingly don't have the big money factor that would impede the hammer falling on them. Melvin Gordon would be nice. I think you can find running backs late or on the streets. Indy got Boom Herron after he was cut by the Bengals. He was a sixth rounder. Alfred Morris was a sixth rounder. I wouldn't spend the second round pick on a running back. Go big in the second round on OLine or DLine. If Rex is pound and ground, and the Falcons get their men in FA, could you see them snagging a RB as early as Round 2, or even trading back in the 1st round to get the RB from Wisconsin? I think that is coming to light. Who else goes down on the sidelines? It sounds like Blank is really more hands on than I would have thought, this is not good for us fans. I like Mr. Blank and appreciate his desire to "put rings on fingers", but just because you where part of a billion dollar retail business does not mean you can build a successful NFL franchise. I have a very bad feeling about the direction of the organization. I think the owner "suggested" the change. Because he felt they couldn't keep with Green Bay in a shootout. Ok Dled- you opened the door- who tried to change the offense. Do you think Rex will take the position, if offered? Rex is POUND AND GROUND and play defense. Like Smitty was before the Green Bay game and somebody tried to change the offense. Are there any clues out there if Rex has any preference or link to potential OCs, if he is hired? would he go to run-1st/conservative or would he allow the offense to do its thing? Very aggressive, they have some cash. Major turnover is expected and needed. How aggressive do you see the Falcons being this off season? Do we expect a big turn over in players? Sounds pretty serious. Brian Orakpo, Derrick Morgan, Akeem Ayers and Jason Pierre-Paul would be the top people to go after if they reach the free agency market. Or a defensive coach , who wants to bring in his own OC. With Kotter leaving does that signal an offense pick for head coach McDaniel maybe? Is there any chance that Mike Smith will step down and take a lesser job with the Falcons, maybe like DC or linebackers coach? 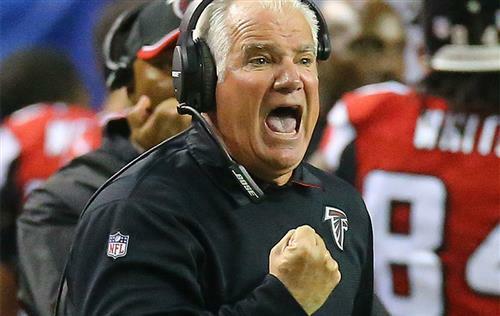 After seven seasons, the Falcons have decided to part ways with head coach Mike Smith, the winningest coach in team history. So what's next? Talk with AJC's D. Orlando Ledbetter about the candidates and the decisions that are ahead. Submit your questions in the comment tab. Do you see the Falcons going after 2 pass rushers this off season now that we know what we know ? What do you think about hiring Rex Ryan and bringing back Mike Mularkey as OC? Any ideas where Smitty might land? Think they need they either need to draft or bring in a young power back like burner turner to take some pressure off Ryan and the passing game. He's well respected in coaching circles. Just would be a projection. What are you hearing about Marrone? He's a great coach with Atlanta ties. Speaking of the character nonsense, do you think Blank is over the character filter at this point? Seemed like TD/Smitty put too much emphasis on that, only really matters for QB. What has he really done? He's green. They are trying to win a Super Bowl with a rookie 36-year-old coach? Doesn't add up. Not sure what you mean. Not paying free agents because of PSLs? I doubt that..
Would AB sacrifice cap management to one off for the sake of selling PSL's? Yeah, that's the signal I picked up too. He really likes Kraft and the Patriots operation. I heard AB make the adaptive comment in his presser, that signals McDaniel. I say no more Patriots unless Bellichick comes down here. Next week sometime. Haven't nailed down the date. When do they plan to interview Rex? No, I don't think he'll bring that kind of clout. If Rex Ryan comes along, is he in a position to change the GM? Seems that AB is open to showing Dimitroff the door if the next HC insists. Love me some Magic Mike. He plays power football. Not sure how adaptive he is, though.